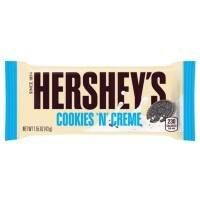 Nabisco's famous chocolate chip cookies are now available overseas! 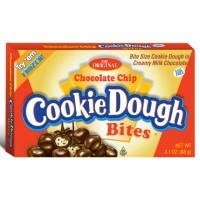 These tasty, crunchy sweet snacks are chock-full of chocolate chips, and kids and adults alike can't get enough of them! Pack your Chips Ahoy cookies in school lunches, or save them for a snack or your next trip to the movie theater. These classic cookies are a thousand chips delicious! 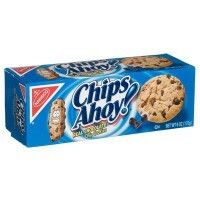 Order other products from the American brand : Chips Ahoy! 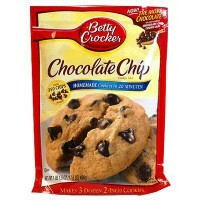 Enriched unbleached flour (wheat flour, reduced iron, vitamins B3-B1-B2-B9), semi-sweet chocolate chips (sugar, chocolate, cocoa butter, dextrose, soy lecithin E322), sugar, vegetable oils (soybean, partially hydrogenated cottonseed), high fructose corn syrup, leavening agents E500ii-E342, salt, whey (milk), natural and artificial flavors, color E150. Contains GMO. Nutrition facts (for 100g): calories 485Kcal, total fat 24.2g (saturated fat 7.6g), total carbohydrate 66.7g (sugar 33.3g), protein 6.1g, salt 0.8g. A tester mais les granola pepite ee chocolat son meilleur!!! C'est de loin les meilleurs cookies ricains que j'ai goûtes. Pour moi c'est un incontournable. I tried these biscuits in the USA and I was stuck - really tasty! Je trouve le goût un peu fade. Manque de sucre, peut-être. Dommage car la texture et super. Délicieux cookies croutillants et moëlleux à l'intérieur.